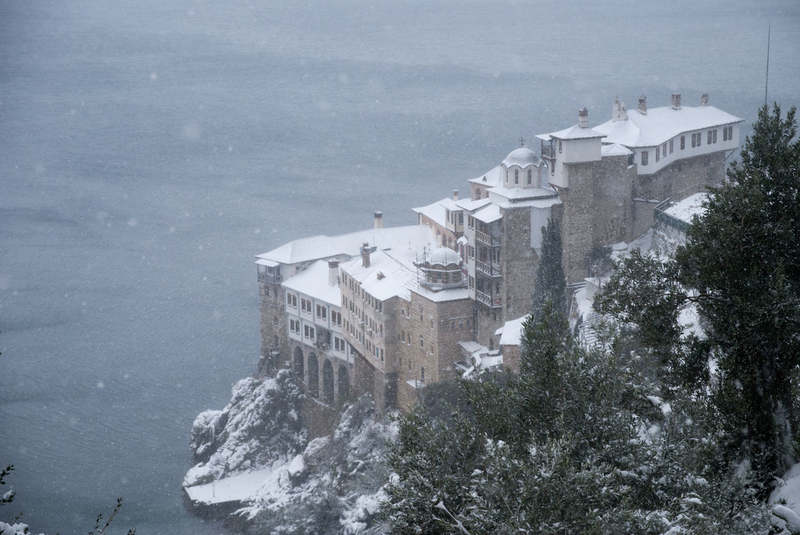 After the snow ball fight the peace was signed and we were off to Dionysiou. It was still the last day of the year. Some of the monks were worried about our walking plans. The path could be very slippery and hard to find because of the snow. We stated that we knew the path. We had walked it before. We promised to return if it was too dangerous. And they wanted to be sure that we had the phone number of the monastery. Just in case. After these precautions were taken they wished us a safe journey and waved us goodbye. The snow was really deep. Twenty centimetres at least. Sometimes even up to the knees. The first of the row of five men had to find the path. The rest followed in his footsteps. So we literally acted out the expression “to follow someone in his footsteps”. We changed positions from time to time. 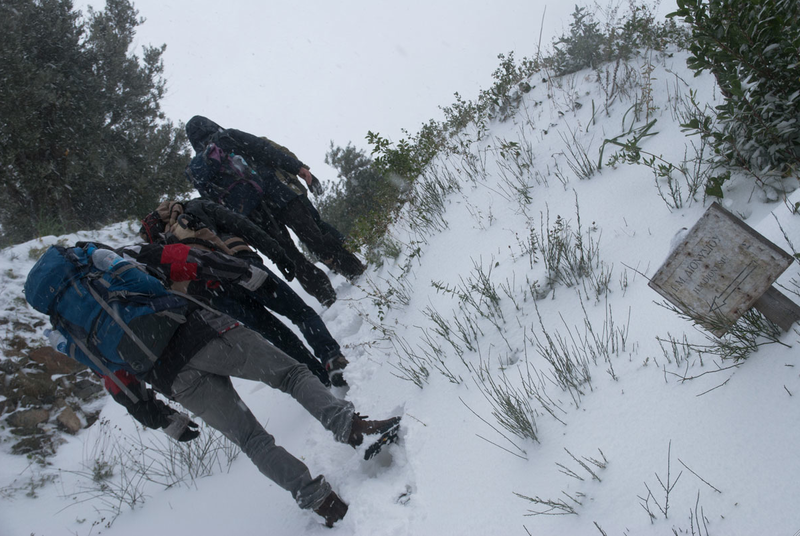 It was mesmerizing to be the first human to walk through the untouched snow on holy land. Sometimes the path was rather difficult to find. At first the monopati went up. There was a closed gate. We turned there following a path up the hill. After a while we found out that we lost the right path. We couldn’t remember that we had been there before. We realised that we should pass the closed gate, and so it was. It still snowed lightly. Looking back on Gregoriou, which we had just left. It was rather tiresome to walk. You had to lift your feet much higher than normally. The path was narrow and lingered up and down all the time. And quite steep as well. It was nowhere flat and easy to walk. 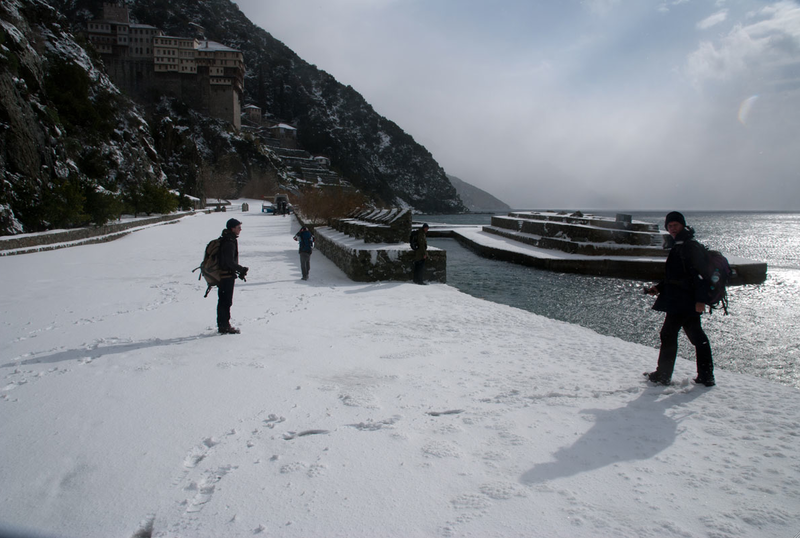 Sometimes it directed us inland towards Antithonas, the second mountain of Athos. There in the coves a fierce wind came over the mountain ridge creating snow storms. But most of the walk the wind did not play a significant role. We were protected by the mountain. Cactuses in the snow and a little stream over the path. Looking back at Gregoriou in the background. 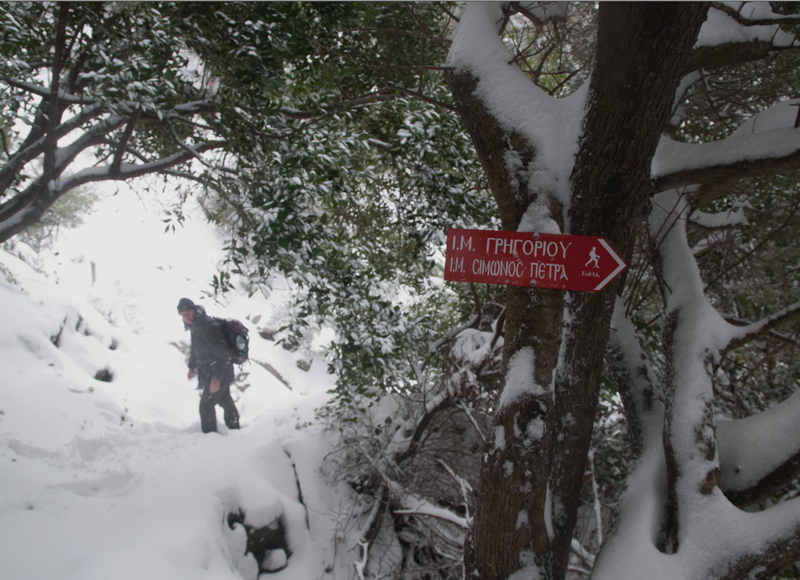 A white sign to Dionysiou. 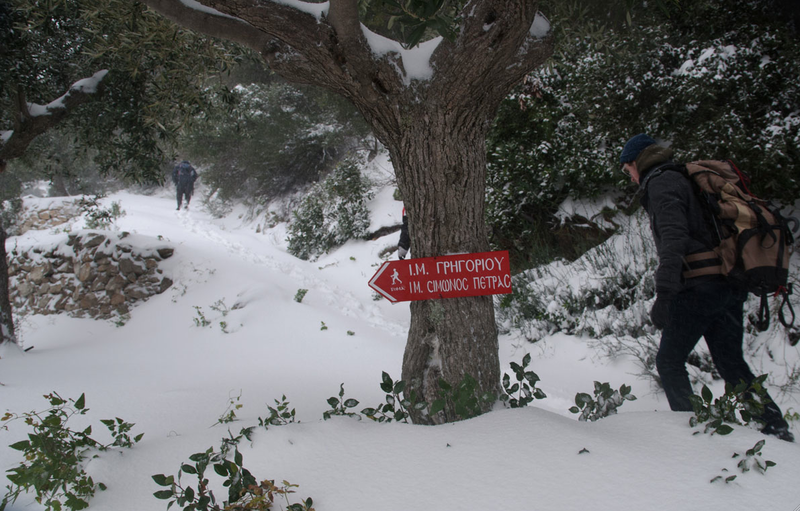 The bright red signs from FOMA (Friends of mount Athos) proved very useful in the slightly disorienting white Athonian world. A last glance at the monastery we left with an olive tree orchard in the foreground. One can see clearly that we walked in each other’s footsteps. If the first walker took too big a step, the rest of the group complained. In the snow you walk a common pace and you adapt. Another FOMA sign in clear contrast to its environment. In the sheltered parts the snow layered itself on the branches and on the green leaves of the trees. Herman almost up to his knees in the snow. Some of us fell several times but always softly and safely into the snow. When pressed by footsteps the snow gave a pleasant balance. It levelled the little rocks on the path and gave some comfort. The crossing of the Cravanistis waterfalls. Luckily there was a bridge. 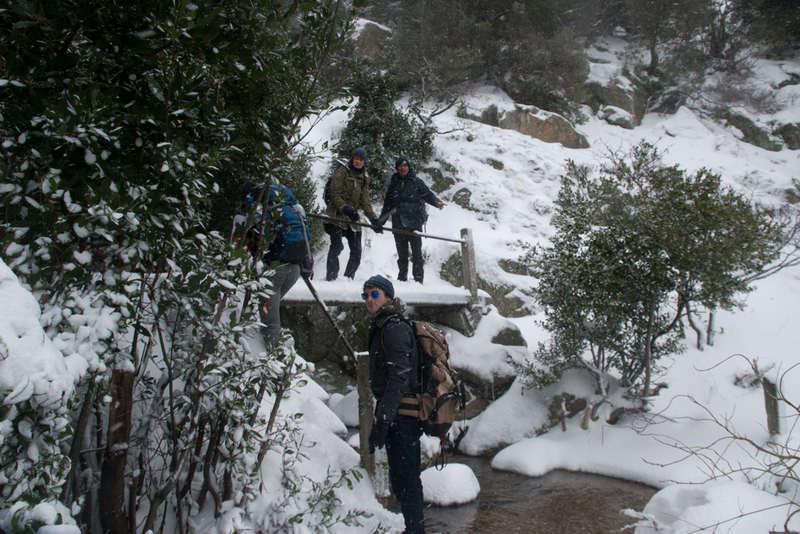 The only problem with the crossing was that the stairs had completely disappeared under the fresh snow. So pilgrim Herman who walked first had to detect the hidden stairs. Sometimes the snow was more than an arm’s length deep. Here Pilgrim Laurens demonstrates the depth of the snow. 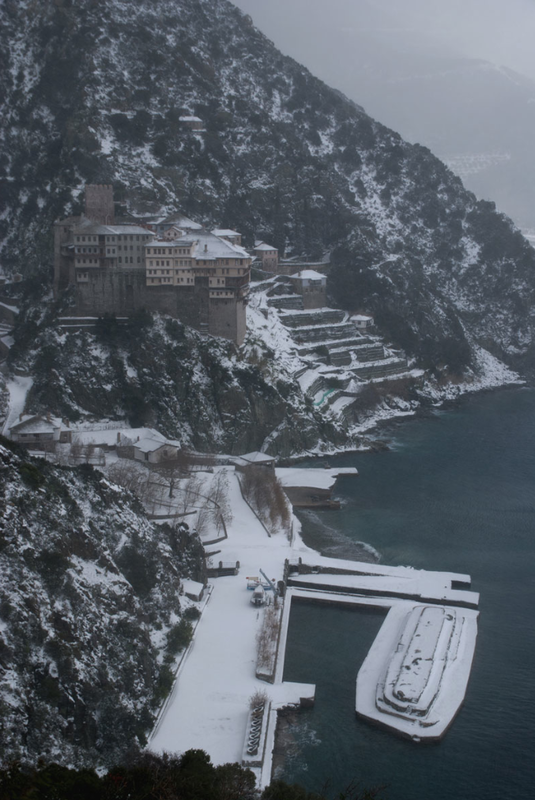 And suddenly there is the first view of our goal for the day: the monastery of Dionysiou with its characteristic harbour. This is where the most difficult part of the walk began, a steep descent into the harbour. Zigzagging our way down. Sometimes gliding over big boulders. Sitting down. Holding for grip on sticky shrubberies. Keeping a good distance from each other. At last with our feet on firm ground. It had stopped snowing and we even saw some patches of blue in the sky. The only task that was still ahead was the impressive climb up to the entrance of Dionysiou. Our original plan was to walk on to Nea Skiti. But because of the weather conditions and the extra time the walk took, we hoped that we could stay here. We had not booked, but we felt sure we would meet hospitality there. We would not be disappointed. 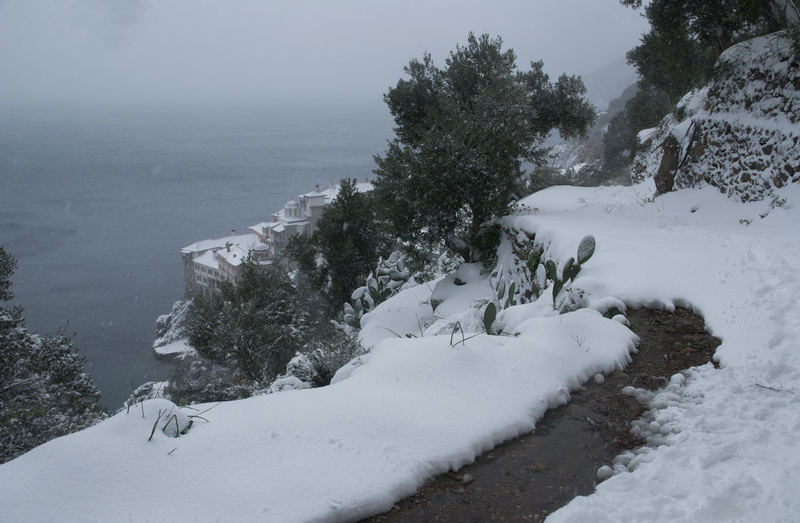 This entry was posted in 05 Dionysiou, trip 2014 and tagged monopati, snow. Bookmark the permalink. Wees blij dat U veilig bent teruggekeerd na deze onverantwoorde tocht!! Als het onverantwoord was dan hadden wij het nooit met onze zonen gedaan. Wij leerden dat als we elke stap door de voorste loper zeer voorzichtig en langzaam namen de kans op breuk, verzwikking of uitglijden (de grootste risicos) minimaal was. De volgende lopers traden in de voetsporen van de eerste loper en hadden daarom geen probleem. Als je desondanks toch het evenwicht verloor dan viel je zacht in de verse sneeuw op het pad. De wind was geen probleem want was weliswaar windkracht 7-8 maar noordelijk zodat de berg ons beschermde. Daar komt bij dat het niet koud was ongeveer 0 graden C en het licht sneeuwde. 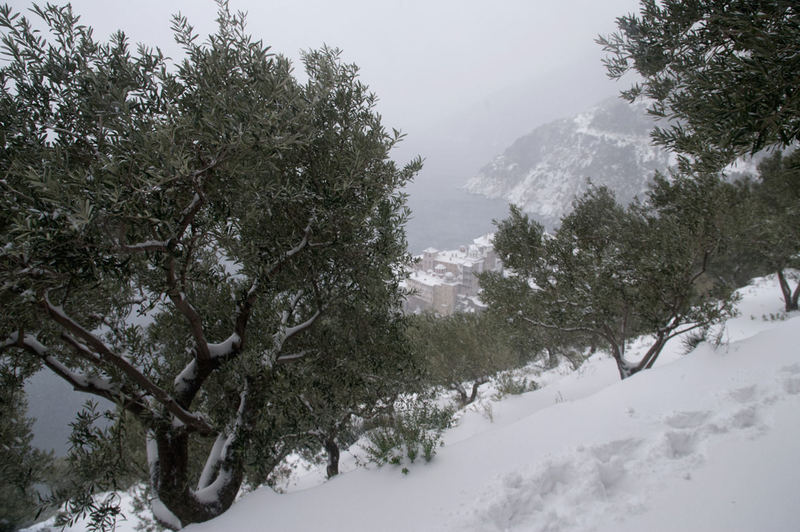 We liepen de afstand van Gregoriou naar Dionysiou in 20 tot 30 cm sneeuw. We deden er ruim een half uur langer over dan met sneeuw dus i.p.v. 2 uur 2,5 uur. We maakten geen gevaarlijke situaties mee, hadden geen blessures of narrow escapes. Wat zeker in ons voordeel werkte dat ik beide trajecten zonder sneeuw twee keer eerder liep. Bovendien hadden we goede schoenen en waren allen getraind. Ik begrijp u bezorgheid want met name de foto’s geven de indruk dat een misstap tot nare gevolgen zou kunnen leiden maar in werklijkheid was het goed te doen en bovendien maar dat terzijde een onvergetelijke ervaring.